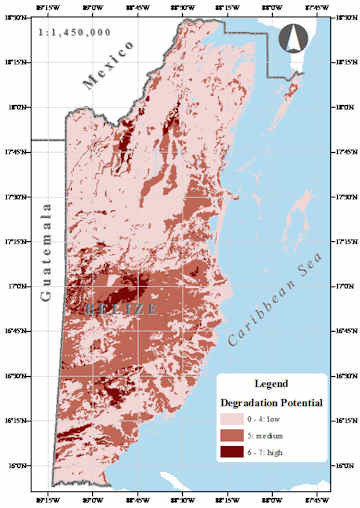 Belize’s 1998 accession to the United Nations’ Convention to Combat Desertification signify that while desertification per se may not be nationally significant, the counterpart issues of land degradation and drought are pertinent to the nation’s management of its natural resource base. The Convention itself defines land degradation as taking three main forms, namely (i) soil erosion, (ii) decline in soil fertility, and (iii) land conversion. Drought, in turn, is treated as “precipitation…significantly below normal recorded levels. It is also acknowledged that is difficult to separate the causes of land degradation from what actually constitutes land being degraded. The causes of drought, on the other hand, are more easily separable from the drought phenomena. The causes of drought are, like those of land degradation, related to human activities, which may be direct – in the case of water shortages due to mismanagement (i.e. overuse) of water resources – or indirect, as is believed to be the cause of climate change / climate variability which affects the precipitation regime. 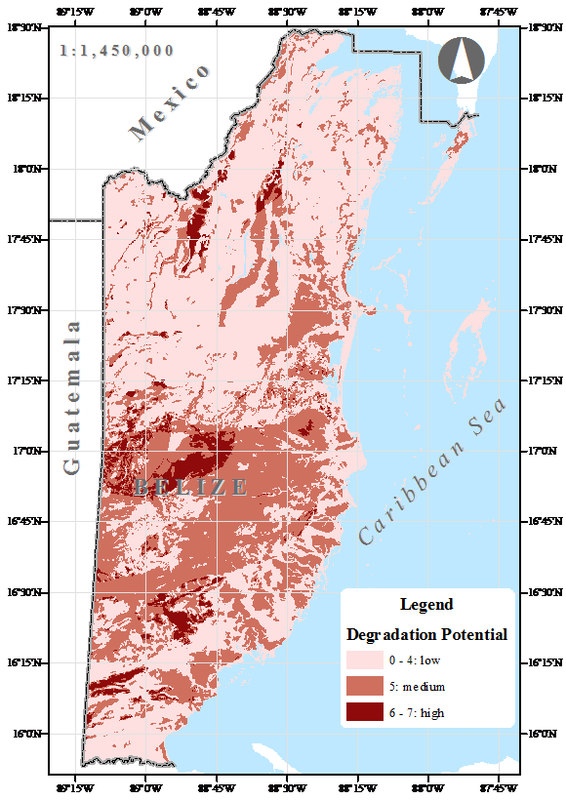 In essence, the above constitute the “what” of land degradation and drought in Belize. Communities affected by degraded ecosystems within a radius of 5km from that community. Click for larger size map. 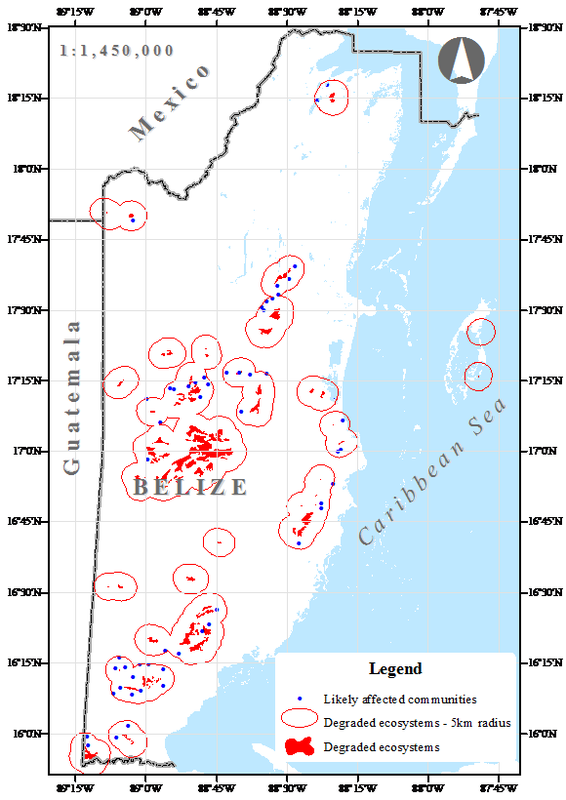 The related questions of “where,” “how much,” and “who is affected” can be addressed through spatial analysis possible with the technology of geographic information systems (GIS), which itself has been with Belize since the early 1990’s. Such spatial analyses reveal alarming trends with respect to the phenomena in question. Almost a third of the roughly 1 million acres of agricultural land in Belize occurs on land classified as marginal or unsuitable for agricultural activity. 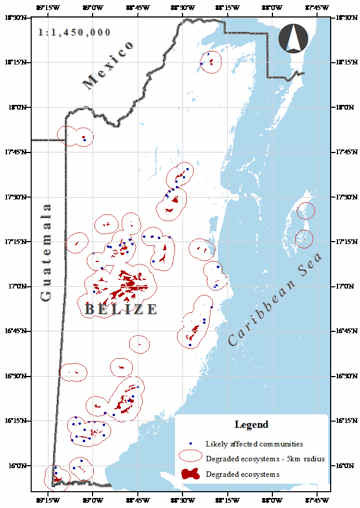 More than a third of all agricultural land in Belize is on acidic soils particularly sensitive to land degradation. Almost a tenth of agricultural activity occurs on steep slopes prone to erosion – mainly in central Belize, such as for instance, along the Hummingbird Highway. What’s more, 4% of all agricultural land is located in areas at extreme risk of erosion, should there be sufficient rainfall (such as in a storm event). Where land conversion is a major cause of land degradation, it is also worth noting that available data indicate that half a million acres (almost a tenth) of the nation’s land have been deforested in the past thirteen or so years, doubling national agricultural cover in a short period of time. Drought, on the other hand, may affect a greater proportion of agricultural lands. Almost two-thirds of all agricultural lands overlie limestone (i.e. prone to desiccation), while almost forty percent of all agricultural land is in low-rainfall prone areas. These factors combine to put almost a third of Belize’s agricultural land in very drought-prone areas. When both land degradation and drought are combined into a spatial model of risk, it is indicated that almost forty percent of the country’s landmass is at risk for degradation. In terms of the raw human impact of such phenomena, it is estimated that at least fifty-five communities representing at least 18,000 people are affected by degraded and drought-prone lands. In light of all of the above – which themselves may only hint at the true magnitude of land degradation and drought – a number of suggestions can be made. be monitored if not outright addressed. Farming in areas not already cultivated but nonetheless prone to degradation should, for instance, be discouraged, and currently degraded lands should be subject to restoration activities. Lastly, recommendations regarding addressing land degradation and drought underpin the urgent need for comprehensive national land use planning (for land degradation has largely occurred in the absence of planning).